The illness of Palestinian President Mahmoud Abbas once again opened a barrage of questions about the fate of the Palestinian cause amid inter-Palestinian divisions and Israeli voracity for territories in the West Bank, Jerusalem and taking advantage of US support for voiding the Palestinian struggle. Analysts and observers believe that post-Abbas there will be chaos and bickering among key families, tribes and clans, which is what Israel is waiting for after Abbas exits the scene and the Palestinians have no leader. Tel Aviv will take advantage of this new situation and reward those who cooperate with it through financial support, while imposing a siege and restrictions on those who disagree with it. Annexing Area C in the West Bank would be easier than at any other time due to the political vacuum. Emad Abu Awad, director of Al-Quds Centre, explained that Israel’s settlement plans will never abandon the occupied West Bank territories, since the West Bank is the only option for Israel’s urban expansion. Due to current circumstances, Israeli plans to annex Area C has already started by holding onto the West Bank. It will be the graveyard of peace agreements which since the start were an illusion and show Israel’s intentions of staying in control of the West Bank. Abu Awad said the Israeli right-wing always talked about the religious and ideological significance of the West Bank hills, noting that Neftali Bennet, leader of Jewish Home Party who represents settlers in the cabinet, said the West Bank holds the history of the forefathers and “great Jewish heritage” is located there and can never be abandoned. For Israel’s right-wing it is more important than Jaffa, Acre and Haifa. Any influential parties on the Israeli scene, with the exception of the left-wing Meretz Party, strongly support remaining in the West Bank albeit in different shapes and forms with variations on the territories that must remain under Israeli control. There are those who believe remaining in the West Bank and maintaining control there is a security treasure that should never be compromised because abandoning the higher grounds there puts Israel’s security at risk. Others believe that urban expansion is no longer possible without the West Bank which is key to absorbing immigrants and urban expansion. Major General Gershon Hacohen, a researcher at the Begin-Sadat Centre for Strategic Studies, said the way Yitzhak Rabin divided up the West Bank into areas A, B and C was very clever and with exceptional foresight. He said Rabin knew these areas will remain under Israeli sovereignty, so he transferred areas A and B, which constitute 40 per cent of the West Bank territories and are home to 90 per cent of the population, to the Palestinian Authority (PA) and kept 60 per cent of the territories under Israeli control with no more than 10 per cent of the population. Meanwhile, Israel has started to register land in Jerusalem in its name, which had been forbidden since the occupation of the holy city in 1967 due to the Absentee Property Law. The National Bureau for Defending the Land and Resisting Settlements belonging to the Palestine Liberation Organisation (PLO) said the occupation continues to take advantage of the US’ position on Jerusalem, and Washington’s recognition of Jerusalem as the capital of the “Israeli” entity in order to grab more land and property belonging to Palestinians. Experts believe this would mean confiscating Palestinian land and property under the pretext of assets belonging to “absentees”. Mounir Oda, an expert on Israeli affairs, said Tel Aviv passed several laws against Palestinian residents to expel them from the holy city, including cancelling Jerusalem residency, destroying homes, suspending laws that support their presence in Jerusalem in order to bring in Jewish immigrants and expanding settlements. Oda continued that the Knesset is always trying to grab land at every opportunity, most recently by trying to register land in Jerusalem that is unregistered, which accounts for some 96 per cent of the city. Jamal Omar, an expert on Jerusalem, said that registering Jerusalem property is a law that is torturous even though it may appear benign, because it will open a Pandora’s box since Jerusalem residents do not have full proof of their property ownership, and many live overseas. Others are living outside the Separation Wall running through Jerusalem and therefore this measure aims to take control of the city and officially confiscate more land. “What is occurring by changing the names and historic sites in Jerusalem by the occupation is a type of forgery which carries criminal charges for Israeli officials,” asserted lawyer and expert on international law Anis Qassem. He said meddling with any antiquities or historical sites would be a war crime and desecration and sabotage heritage. Qassem said that antiquities are protected by international law and The Hague Treaty of 1907. Discussing the “deal of the century”, political analyst and professor at Bir Zeit University Nashaat Al-Aqtash said the initiative is planned for implementation with Hamas not Fatah, since leaked reports about the 2014 deal reveal an offer to create a statelet in Gaza, while the West Bank remains under limited self-rule without any change. Thus, pressure is mostly on Hamas to accept the deal. The group is also under Arab, Palestinian, US and Israeli pressure to accept the deal to end the Palestinian struggle. He added that once Hamas accepts the deal under any pretext it will be a fait accompli. Al-Aqtash believes Abbas will not call for a meeting of the Palestinian Legislative Council and therefore if he exists the scene it is possible that the PLO would put forward Saeb Erekat as an interim president since he is secretary general of the PLO’s Executive Committee. Hamas could also use legal justifications for the second deputy of the Legislative Council Ahmed Bahr to replace Abbas if the latter, as chairman of the council, is absent. This would result in two councils and two entities, which is what Israel wants to see happen. There are three key facts, he continued. First, Abbas will not call a meeting of the Legislative Council since Hamas is a dominant member of the council with one third of the seats. He explained if the council meets, Hamas will immediately change key legislation and the political structure. Second, that Gaza was handed over to Hamas and it foolishly became embroiled in it, “which is what led us to this endless disaster”. Third, that Abbas rejected the deal of the century but only because the PA is not part of the deal. His rejection should have ended division immediately, especially since Hamas honoured its responsibilities, but the PA is still procrastinating. Abbas, 82, spent one week in hospital in Ramallah starting 20 May where doctors said he came for tests after ear surgery five days earlier. But the next day they announced he has pneumonia. 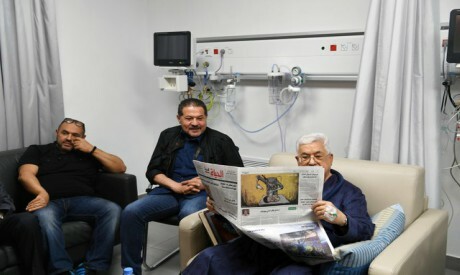 In February, Abbas, who is a chain smoker, was admitted to hospital in the US for tests during a visit to address the UN Security Council.